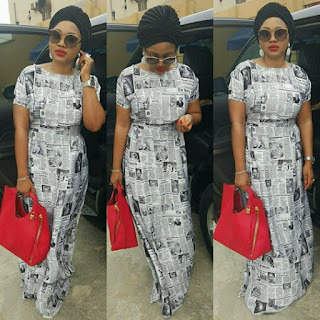 CHECHESMITHNATION : Mercy Aigbe Gentry Rocks-Out In Newspaper Print Dress! Mercy Aigbe Gentry Rocks-Out In Newspaper Print Dress! Pretty actress, Mercy, steps out wearing this news paper print dress by Abbyke-Domina ,paired with a black turban and a pop of red coming from her handbag. We are so loving your style Mercy!